Finally the Black Armada site is live, so I can link to Admiral Rabalias’ Johari’s Window article. I’m keen on using tools like the Johari Window to express character traits. They require less interpretation than Everway‘s pseudo-tarot spread and allow players to express their character more or less in a way that they prefer to communicate and read information. Everway’s Fate/Fault/Fortune spread serves an in-game (narrative) purpose. Tools like the Johari Window, or Mind Mapping, or a Mandala Chart should be useful within the game, rather than just mental masturbation character creation aids. There are a couple of ways to achieve this. You could take Burning Wheel’s approach: let the players create all of the cool character background in isolation using the BIT system and then have the GM link all of the bits and pieces of character’s lives together. 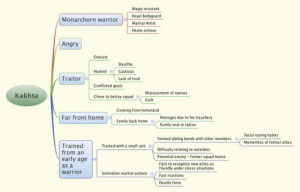 This provides the “story engine” to generate the overall plot. While this approach is fairly progressive in terms of generating story, it’s also quite “traditional” in that it doesn’t restrict player choice of character much – players get a list of character classes and will generally pick the weirdest thing on the menu, and it’s up to the GM to then bring an unlikely group of characters together. I prefer a restrictive framework to link the characters together – as part of a family, organisation, or throwing them together into a situation. You can do this with the BIT system of course, making it a bit less of a blank canvas. Let’s call this a “closed” vs “open” creation method. Now on to the tools. Map by Prog Drummer Michael Petiford. 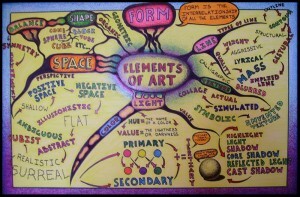 Also, look at the fantastic Mind Map Art site. My map isn’t nearly as pretty, because I knocked it up in XMind. Kakhta was a real character I played many years ago. He was part of an invasion force in another continent, and was part of the nobility or ruling elite in his homeland. He was immune to magic. He chose to leave his comrades and join the resistance (the other PCs), resulting in deep personal conflicts. He integrated with the rest of the party and discussed cultural and culinary differences between their peoples. 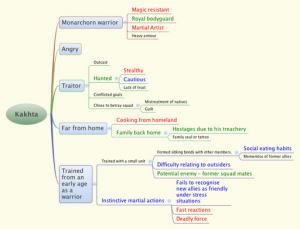 I picked five major features about the character, and then used the map to expand on each. I didn’t worry much about order or depth of information – the intent with the mind map is to dump information onto the page as swiftly as possible. Everything else I left black. Some of the items in black could be behaviours or other talents, but their overall impact on play is low. Not a great deal of depth but enough to hang a plot on. Add another colour for physical appearance and you could have a reasonably rounded character. Of course I haven’t actually said which system I would use. For the Ability nodes I could add percentages (BRP), levels of competence (FATE) or any other descriptor that fitted with the system. In fact FATE might work quite well with this technique since it expects people to be average in skills that aren’t explicitly named – that takes away any need to have stats outside the mind map. The other thing you could do with the map is to enable characters to grow in areas they hadn’t previously thought of. Let’s say the characters travel to Kakhta’s homeland on a mission to infiltrate the Autarch’s palace. Suddenly we ask questions about what other skills Kakhta can bring to the game. His background as a bodyguard could give him skills his player hasn’t considered yet – but the map enables him to keep some character points back and spend them later in a fairly credible fashion. p>That’s enough for now. Next time, Mandala Charts. Wounds are clues. Clues that point to the superior combatant in a contest of skill. Clues telling a character that things are not going well. If a character gets a scrape, that tells them the next blow might be a cut or a slash. A stab will likely be followed by something more serious. The trouble is, we don’t do this very often. We don’t signpost the trials a hero goes through because mechanically we’re not really equipped to. Hit points are not a measure of pain, they’re a countdown to one side losing; wound levels that penalise action make it harder for a PC to do something, but don’t necessarily change the appreciation of risk. It’s the incremental pains that make the players feel what their PCs are going through. What you really want is for players to feel the hurt and know that it will get worse unless they do something to protect themselves, but not necessarily penalise them for how they’re feeling right now – because that affects the more important decision of personal risk vs the goal. At all times PCs need to be free to act, but be far-sighted enough to forsee the consequences of their choice. I’ve had the Amber DRPG in my collection for years. Picked it up occasionally, skimmed it, put it back. 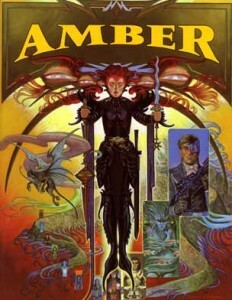 Recently I got around to reading the Chronicles of Amber, so I picked the game up again. Suddenly all of the references make a lot more sense. Mainly though I gave it a proper read because of my interest in running diceless, low complexity but high drama combat. The books are fight-heavy but (as Erick Wujcik notes) Zelazny skips over large fight scenes with ease when they’re just window dressing, but manages to get to the heart of the drama and give a blow-by-blow account when it’s a pivotal fight. And of course, the combat section follows this premise. In quite a lot of depth in fact, especially since the resolution mechanic is whoever has the higher rank, wins. Now I can do the fight narration stuff, but the book still does a really fantastic job of showing the GM where to best place her descriptive efforts. It also gives a lot of nice hints on how a weaker opponent might overcome a strong one (through trickery, outlasting them, etc). It also does really well with five tiers of “relative competence” between player vs antagonist – from clear superiority to being clearly outmatched. The system also suggests some stances (“furious attack”, “opportunistic stand” or “defensive”) which serve as simple markers for players to use as statement of intent. There are a few more choices for sword-fighting or grappling, but all the options are very clearly expressed. There’s a lot that can be learned for Everway. In fact, my premise for the Battle of Everway was to form a high drama but low crunch combat system, and Amber has pretty much already done this. On the other hand there are one or two things that I don’t care for in Amber: the point-based character generation and attribute auction make sense where sibling rivalry matters, but won’t work for my game. So I don’t think analysing Everway is effort misspent, more that the two games complement each other. Amber is available through DTRPG for $12, bargain. In Part 1 I discussed preference. The intention with Part 2 is to see if Everway can be made into a realistic combat game at the iNtuitive end of the Myers-Briggs information gathering axis, as opposed to the Sensing end where most systems that aspire to “realistic combat” (Riddle of Steel, etc) lie. The first step to doing this will be framing the combat. In Part 3, I’ll talk about actually running the game. Rolling dice isn’t in the spirit of Everway, since each level of element is supposed to be twice as powerful as the last. Making a game out of that premise just wouldn’t work. Introducing more granularity in the skills goes against the way characters are drawn with a broad brush, with just four talents – each talent’s significance is diminished if there are simply more talents. And while Fate Points would work, they’re not necessary. In fact they might be a hindrance, since it would upset the GM’s interpretation of the cards. They might be used to force the reading of another card, but they shouldn’t affect the overall balance of power in the conflict. Fire – represents dynamic flow, vigor, physical action and reflexes. This will always be the most important trait for combat. Earth – represents natural physical might. Everway uses this trait as endurance, but it could indicate reliance on physical talent/strength rather than trained skill. Air – represents tactics but also technique. It’s the opposite of Earth – representing the way technique and martial system can overcome pure physicality. It also represents detatchment from the reality of the fight – treating it analytically, or as a sport. It has significance for ranged combat as well. 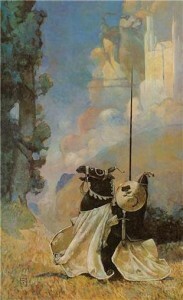 Air is an advantage in certain theatres, like formalised duels. Water – represents trickery. All fighters need to be aware of dirty fighting. This is an assassin’s trait, and opposes Fire’s reflexes with hidden attacks. These definitions don’t have to just apply to characters – they can also relate to the environment and scene. 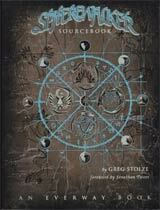 Since most of the cards in the Fortune Deck have elemental correspondence, a deck reading could be used to plan out a combat. For combat the GM takes a number of factors into account when running a fight between two parties. The relative Fire scores will (almost) always be of highest importance. Earth scores are also considered (for fatigue, etc). Whether one or both sides are armed is a consideration, and any other traits (e.g. powers) can be considered too. The GM simply adjudicates a result, based on all factors (a Karma/Drama method). The GM picks a single card and interprets it to give a result. The GM runs a blow-by-blow combat, effectively adjudicating each “round” with a single card reading. This is absolutely sufficient to run combat in Everway. In fact I don’t propose to deviate from this approach. However there are a couple of factors that will help set the stage. Games are very bad at factoring in the environment. But I can tell you from experience that fencing on marble or wet grass in smooth-soled period boots is not the same as fencing in a sports hall in trainers. I understand some martial arts developed in swampy areas will involve sliding the foot as opposed to stepping. Then there’s movement in the third dimension – what if your hero is fighting something that’s flying or leaping? What if it’s hard to see? Fire – represents a dynamically changing landscape. Maybe it’s a fight on a weir, or a broken rope-bridge, or on the backs of horses while in pursuit. Earth – represents being closed in. Maybe it’s a tavern with low vaulted ceilings, or a crowded street, or maybe the opponents are just very close to one another. Air – represents a very open landscape. Perhaps it’s a wide plain where the hero is at risk of being shot before she can close, or perhaps it’s a formalised duel in an open space. Water – represents something hidden. Maybe the arena is littered with sink holes or pit traps, or something else for combatants to trip over. Maybe an attack comes from the third dimension, making it harder to defend. Maybe it represents the enemy itself being hidden, and not being encountered until too late. Someone with an affinity for that element will be at an advantage compared to an enemy that isn’t. Someone who is strong in Earth and mighty will have an advantage when being very close (e.g. wrestling), and someone who is wise in Water will be on the lookout for tricks and traps. The scene itself is a kind of environment, but in this case relates to mood of the piece. Fire – open argument. Tempers flare, combatants posture and taunt. Earth – no oversight. Something that happens out of the view of others. No external pressure to perform, but at the same time no-one coming to your rescue. Just the hero and her nemesis in a cave. Air – theory, rules, and bureaucracy. A formalised and observed combat, with a significant outcome that may not be immediately understood by the heroes. It may even be grossly unfair, and yet impossible to dispute. A judicial champion fights against a much weaker man who has been falsely accused and has no way of proving his innocence. Water – veiled threats. Hidden observers who will take an interest in the outcome – possibly even aiding one side or the other. Dogs In The Vineyard’s conflicts start with this question, and it’s great advice for framing the narrative battle. Fire – life itself. A fight to the death. Earth – physical pain and discomfort. It may be a brawl where no-one actually wants to kill each other, just clear the air. Air – the Rules, Law, a Principle. A precedent will be set upon the outcome. Water – a Relationship or a Reputation. A person’s Face in front of the community. Finally you might want to consider why the antagonists are behaving the way they are. Fire – hatred: they bear a grudge against the heroes. Air – rules: they are acting because a Law tells them to. This Law may be a person in authority, a religious doctrine, or something else. Water – manipulation: they are working for someone hidden, who had their own motives. If they have been duped into acting, choose one of the other elements as a “cover” motivation. Earth – basic need: the characters have something the antagonists need to survive. Air – reason first and offer terms of surrender. Water – trickery and kill/capture. Earth – overwhelm, subdue and capture. Of course different characters in the groups will have different motivations, and different strategies. Just for fun – you might want to randomise what’s most important for your scene by drawing a card and noting the significant elements. Fire is What’s At Stake? Air is the Antagonist’s Strategy. I’ve included the above just to help randomise, however. Once you start getting into elements-within-elements, it all gets a bit meta. There are no hard and fast rules to determine how elements can overcome each other. But here are a few suggestions. You could consider the hierarchy of elements. Fire dominates Air because it crosses open spaces quickly, and moves faster than the eye can track; Air dominates Water as intelligence uncovers duplicity; Water dominates Earth as cunning overcomes brute strength. In turn Earth may dominate Fire as strength holds the body fast and inhibits motion. Of course those pairs may be interpreted in the opposite direction, but the test is the same – only the outcome is different. Can entry by stealth (Water) overcome a castle defences (Earth) or is the castle impervious to a sneak attack? Perhaps the castle is only impervious because it contains some element of Air in its design – intelligent patrols, wide open spaces with lookouts, and so on. Next, consider the elemental axes. Fire and Water negate each other as speed and reflexes counter deception. Air and Earth do likewise, where analysis meets obstinacy, or an impervious uniform body is shown to have hidden structure. Finally there are the elements opposing themselves. This is the simplest – in all cases where the Environment or Scene features an element, possessing that element will be of benefit. Someone who is Fiery will be quick to act and will answer violent argument with the same. Here are a few examples of different scene settings. In all cases Fire is an advantage, but in some of them other scores will be a peripheral benefit. They’re open to challenge of course – in doing so, perhaps you’ll encounter new and interesting combinations. I’ve used Duel to mean any combat that’s one-on-one, where both antagonists clearly identify one another. It would also apply to a small skirmish which is really a bunch of one-on-one fights spread over an area. Priority: most important is “What’s At Stake?” Least important is probably “Antagonist Strategy” since this is a formal combat where both are on even footing. It’s probably beyond one side offering quarter, and since it’s open there’s not a lot of opportunity for duplicity. Scene: Air or Fire most likely. Air in a formal setting, Fire in a duel to the death. Environment: any. Maybe Fire for a joust, Earth for a boxing match in a cellar, etc. Advantage: Earth is necessary for endurance, and will be a deciding factor if both duellists are evenly matched. In a pistol duel, however, endurance isn’t relevant. In that case Air will be beneficial since much of the duel will be based on technique – in that case, Air will edge Earth out. Water likely comes in third, but there may be a few tricks the GM will give to their cunning NPC – perhaps they keep a pocket full of sand to throw in the eyes of their opponent, if the Scene’s mood does not prohibit it. This template has a few sub-categories. A Brawl is a non-lethal version of a War, probably in a closed (Earth) environment and probably fought because of a grudge or to save face, but stops short of putting life at stake. A Riot is more dangerous and could be in an open or closed environment. A War is military action. All three are likely to be chaotic. Where two bodies of warriors come together, each combatant will probably face off against one or two others, but they’ll also have to be wary of their opponents’ companions. In the massed fights I’ve participated in a lot of casualties come from being attacked on a blind side by someone other than whoever is in front of you. Priority: “What’s At Stake?” together with Antagonist Motivation will determine how far people will go when they are Brawling or Rioting. The Scene is probably lowest priority – it will almost always be Fire as tempers flare. What’s At Stake: any, depending on the people’s motivation. Motivation: Most likely either Ideology (Air), or Basic Need (Earth). Advantage: for the chaos or a massed fight, particularly in a closed space, Earth will be highly important. However Water could be even more significant – not only will it help the heroes evade the worst of the fighting, it also helps with all-round intuition and awareness of danger from unexpected places. Fire is still overwhelmingly important, especially for keeping your companions safe. Air is least useful – there will be no order and no rules. This is a case of a sudden surprise attack. Priority: Environment is key here. “What’s At Stake?” and Motivation are pretty much irrelevant if the heroes don’t know why they are being targeted, and Strategy is likewise not a factor – it will always be Stealth. Environment: Earth and Water will make good environments for assassination attempts. Scene: most likely Earth, but could be any. Advantage: Earth isn’t helpful here. Water is most useful for spotting duplicity, and Air may be useful for uncovering an assassin before it’s too late. p>That’s it for now. In Part 3, I’ll discuss how this all fits together when running the game. I’ve reviewed and discussed several bits of RPG combat system, because I like to run combat in games, and quite a few people like to play combat. However, all of this focus on the “perfect combat system” has so far been a quest for the perfect rules. This fixation will inevitably lead to flawed conclusions. A new RPG system has no excuse simply to rely on the old paradigm of (1) roll initiative, (2) roll to hit, (3) roll defense, (4) roll damage, (5) check for stunning, etc, etc. This is a leftover from wargaming and is strictly Simulationist + Gamist. p>Fine, although he also acknowledges different preferences for different kinds of player. So let’s consider rpg combat as an exercise in information gathering (specifically as Myers-Briggs‘ second dichotomy, Sensing vs Intuition). The result of any combat will be one or the other side wins, regardless of what the dice say, but what is crucial to player experience is how that information is gathered iteratively. Now consider the classic stereotype of the teenage boy gamer: attention to detail and strong feel for system (with the incumbent science aptitude and difficult social interaction, etc). Strongly Sensing, they prefer literal and tangible information, possibly presented sequentially. Of course there are plenty of Ns who roleplay – I’m one of them. We like abstract and theoretical information, to consider the “bigger picture” and wider context, and future possibilities. I may be rather over-simplifying it – and apologies if I offend any psychologists – but I see this dichotomy as bottom-up vs top-down. And if we’re talking about Myers-Briggs we should also talk about the other functional dichotomy, Thinking vs Feeling in decision making. Thinking is highly objective, logical and consistent whereas Feeling is highly subjective – making decisions based on situation and the best consensus and fit to the needs of the people involved. It could almost be the two poles of a Simulationist vs Narrativist dichotomy. (discuss). For the record, I’m INTP (a long time ago I was INTJ. I think becoming a manager changed me). As an amateur game designer it could explain my love-hate relationship with simulationist-gamist systems: I like objective truth and consistency, but have little tolerance for detail and prefer an overview. What’s the point of this diversion? Of course the Roleplaying community has different people with different preferences – that’s obvious. And of course the traditional rpg as described by Ron Edwards caters to a specific preference (at a guess I’d say ISTJ – discuss!). Going back to that “perfect combat system” I titled this post the Battle of Everway because I think the modern detailed systems – like Burning Wheel, Riddle of Steel and Exalted have got it wrong in terms of simulation. More detail causes the system to diverge from the “realism” some of us crave. And perhaps to make a system more realistic, we don’t need more rules – we need to pay attention to players’ preferences regarding how they get information and make decisions. So I was considering a game with hardly any system at all. Could I make a decent combat simulation using Everway? I’ve already talked about the Elemental Mind, and my plan for part II will be to build on those concepts while remaining faithful to Jonathan Tweet’s Karma, Drama and Fortune method. Yet another blog post about Everway, the doomed fantasy RPG system that tried to ride the Magic: the Gathering gravy train and failed miserably. Here’s what happened: in the mid-90s, Wizards of the Coast had made a lot of cash on MtG and decided to make a roleplaying game. 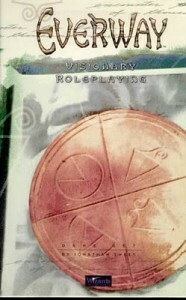 The roleplaying game would come in a nice big box (in an era when RPGs were moving to softback large format books) and contain pretty art cards that were a visual part of the game experience; but more importantly they were a gateway drug to usher roleplayers into the CCG market. This was the problem. They sold a basic set with 90 “vision cards” as well as a “fortune deck” (like an expanded and tweaked Major Arcana for Dummies). More Vision Cards could be purchased and collected. But the extra cards didn’t come in nice 90 card sets – they came in random 8-card booster packs a la MtG. Now, MtG players are abundant, and each one will buy loads of cards for themselves and end up with surplus to trade, so randomised boosters are no problem. But for a RPG, the first person to buy the set and the cards will be the GM, and the chances of their players all buying sets themselves are slim. The chances their players would buy vision cards for themselves are slimmer. The chances that enough Everway GMs would get together in one place to trade their surplus cards must be miniscule. Since I looked into Everway I’ve also looked at the general fantasy art card market. FPG produced sets of fantasy art in the mid 90s by the likes of Jeffrey Jones, Christos Archellios and Ian Miller in booster packs just like MtG cards. But the market for art card collectors must be slightly different from the market for GMs who are using them as RPG props, and that market is different again for MtG players. The market is not the same – only a handful of Everway GMs would have the completist mentality to get all of those cards – the rest would probably spend their cash on White Wolf games (hey, it was the 90’s). I understand that distributors were forced to take Everway if they wanted to sell MtG. That alone indicates that Everway wasn’t considered a strong enough product to stand on its own merits, so in WotC’s eyes its card was marked. That’s why today you can get complete boxes on eBay for less than a single modern RPG book would cost. Even if you pay 25 quid (the high end of the price range) it’s a bargain. The box contained three little books (not too fat and a nice size to read), one for players, one for GMs and a special book about the fortune deck. It also contained 90 Vision Cards, a Fortune Deck, and a few other cards. And it had a whole load of full colour, double sided pre-generated characters. You can read the summary of the system on the Wikipedia page. But basically this is the system summary: characters are defined by their scores in four elements, which are then used to compare their ability with the task at hand in one of three ways – karma, drama or llama fortune. The first just uses the ability score and asks “is the character up to it?”; the second provides a result based on the outcome that fits the dramatic situation; and the third is randomised. That’s nothing earth-shattering but it’s nice to see it expressed so succinctly. I believe that four is the sweet spot for simple (and indeed complex) RPG systems. Now, Everway isn’t the first system to use a four attribute model, but it manages to be one of the more intuitive approaches. And really all a player needs is to know whether their character is equal to the task at hand or not. Yes, Everway paints characters with a broad brush (four attributes, four speciality skills, maybe a power or two) but that’s enough; it’s good to have implied power, because it enables player creativity and it allows for them to add extra dimensions to their character that haven’t been considered at generation. And character stats can be written on an index card. Greg Stolze writes a bit about Everway here, mostly about his contribution Spherewalker, which is itself a fantastic piece of work and completely systemless. He says he wishes the public had loved that work as much as he did, and I agree. He’s also interviewed here, using that “Everway is right-brained” phrase he’s so fond of. Which will irritate certain friends of mine with psychology degrees, which is a bonus. This to me is what Everway is all about – images and art, not dice. As far as I know this picture doesn’t appear in the Everway card sets, so I’m going to look for some Jeff Jones FPG sets. Can’t imagine why we don’t use art cards more – we bought enough MtG boosters.